The Kempinski Hotel Bahía is a beachfront hotel ideally located 15 minutes' drive from the heart of the luxury shopping Puerto Banús & Marbella and just less than 1 minute' from the beach. The hotel is located within two hours of most Andalusian cities, and is just a short ferry ride away from Tangier, Morocco. The Kempinski Hotel Bahía can be easily reached by car, taxi or public transport and is located 50 minutes (80 km) from Malaga's International Airport and 50 minutes (50 km) from Gibraltar International Airport. We look forward to welcoming you for your next holidays! Should you require early arrival or late departure, please contact our Reception team. Service is subject to availability and an additional cost might apply. 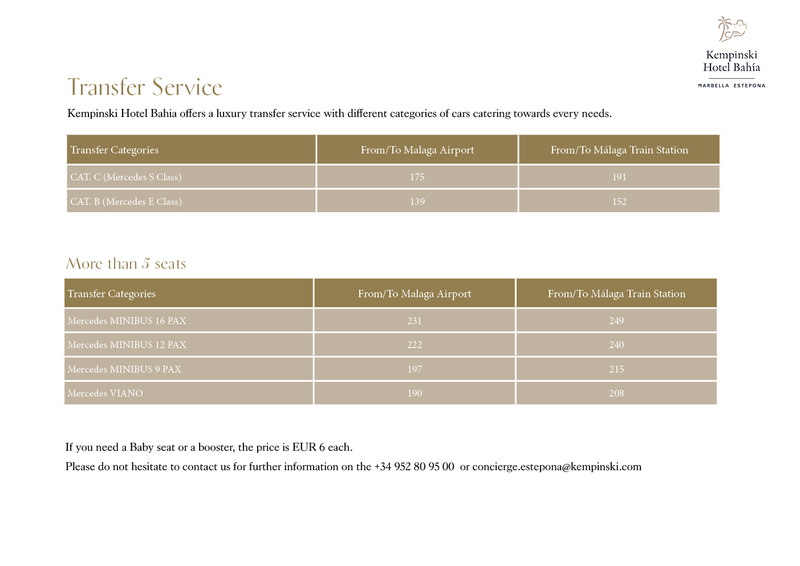 Kempinski offers a luxury transfer service from Málaga airport or train station with diferent categories of cars catering towards you every need. Please find here the list with all prices. You can book the car of your choice from our preferred partner SIXT - one of the world's leading car rental companies. It is possible to take your car at the airport and give it back at the hotel, at the Sixt desk, which is located opposite the hotel's reception. Choose the car of your choice from the modern fleet. For further information please, click here. A taxi station is located directly outside the airport exit, our guests will easily hail a taxi to transport them efficiently to Kempinski Hotel Bahía. The transfer fee for one way is approximately EUR 90. Choose one of the dozens taxis that will be waiting for you at the entrance of the railway station and head for Kempinski Hotel Bahía easily. The transfer fee for one way is approximately EUR 105. This section of the highway is about 28 km long and will take approximately 15 minutes. Continue on the A7 in direction Marbella and after a few kilometers you will see the exit Estepona – Palacios de Congresos. Please do NOT take this exit, take the first service road found immediately after this exit and continue driving until arriving at the Kempinski Hotel Bahia.